The World’s Tallest Water Sphere has been featured as a vacation destination in a recent Go Big or Go Home blog posting. 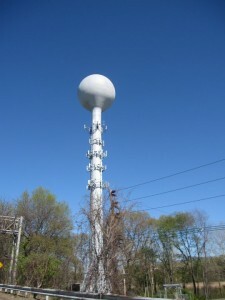 Traci LaRosa Suppa has written our site to let us know that she and her family, who make it a point to visit the world’s biggest oddities, had fun reading and seeing the World’s Tallest Water Sphere. She also took this lovely picture which has just above the clearest, bluest sky that I have ever seen. The blue looks just wonderful backing our beloved ghostly white WTWS. Their family also made the trip to the Edison museum and viewed the WTWS fomr Ingersoll Terrace, home of the Edison houses. Visit their Go Big or Go Home blog and read all about it! This entry was posted on Wednesday, July 28th, 2010 at 5:27 pm	and is filed under Experiences, Photos. You can follow any responses to this entry through the RSS 2.0 feed. Both comments and pings are currently closed.